An unlucky coincidence of space and Earth weather in early September 2017 caused radio blackouts for hours during critical hurricane emergency response efforts, according to a new study. The new research, which details how the events on the Sun and Earth unfolded side-by-side, could aid in the development of space weather forecasting and response. When first responders are on a mission, being able to quickly and easily track the location of their fellow responders can be challenging, especially in situations where the team is spread out. Many responders are only able to coordinate their locations by radioing each other or the command post and providing a very detailed message on their exact location. This can be time consuming and can change every second if they are in an emergency situation or on a call. The Watchtower mobile application allows users to track and report their location using the GPS already built into a smartphone. Researchers have identified several new vulnerabilities in 4G LTE networks, potentially allowing hackers to forge the location of a mobile device and fabricate messages. Ten new and nine prior attacks were outlined in a new study, including the authentication relay attack, which enables an adversary to connect to core networks without the necessary credentials. This allows the adversary to impersonate and fake the location of a victim device. Quantum communication, which ensures absolute data security, is one of the most advanced branches of the “second quantum revolution.” In quantum communication, the participating parties can detect any attempt at eavesdropping by resorting to the fundamental principle of quantum mechanics — a measurement affects the measured quantity. Thus, the mere existence of an eavesdropper can be detected by identifying the traces that his measurements of the communication channel leave behind. The major drawback of quantum communication today is the slow speed of data transfer, which is limited by the speed at which the parties can perform quantum measurements. Researchers have devised a method that overcomes this speed limit, and enables an increase in the rate of data transfer by more than 5 orders of magnitude. There is increasing interest in making broader use of the millimeter wave frequency band for communications on small mobile platforms where narrow antenna beams from small radiating apertures provide enhanced communication security. Today’s millimeter wave systems, however, are not user friendly and are designed to be platform specific, lacking interoperability and are thus reserved for only the most complex platforms. New program aims to create multi-beam, digital phased-array technology, operating at 18-50 GHz to enhance secure communications between military platforms. The DARPA Bay Area Software Defined Radio (SDR) Hackfest came to a close on Friday, 17 November at the NASA Ames Conference Center in Moffett Field, California. During the weeklong event, over 150 members of the SDR community came together to discuss, innovate, and ideate around the future of software radio technology and its potential to address challenging communications issues that are emerging due to the increasingly congested electromagnetic (EM) spectrum and the proliferation of wireless-enabled devices. According to a Federal Communications Commission status report issued last week following a survey of Hurricane Maria damage, nearly 50 percent of Puerto Rico’s cell sites remain out of service, with many counties operating at less than 25 percent of full service. Daniel Bliss, director of the Center for Wireless Information Systems and Computational Architectures (WISCA) at Arizona State University, offers insights about building a wireless infrastructure with the capacity to provide immediate, ongoing communications access during emergency situations. In the wake of natural disasters which have brought communication to a standstill, researchers have been leading an international research team to tackle the problems of maintaining communications under hostile conditions. A researcher at Queen’s University Belfast has been shortlisted for the 2017 Newton Prize after he created a robust wireless communications system which can battle through an earthquake, tsunami or hurricane. Storms like Hurricane Irma and other natural disasters bring with them lots of uncertainty: where will they go, how much damage will they cause. 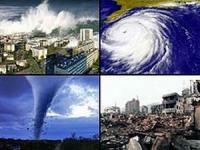 What is certain is that no matter where they strike, natural disasters knock out power. And no power means no internet for thousands of people in affected areas. Researchers are proposing a new way of gathering and sharing information during natural disasters that does not rely on the internet. When major emergencies strike, effective communication is critical. Hundreds, if not thousands, of lives can be saved by rapid, clear and well-coordinated communication regarding impending risks, their mitigation, and how to respond when damage is done. Researchers have created a best-practice toolkit to help developing countries rapidly generate and implement life-saving communication plans in the event of local emergencies. When disaster strikes, it is important for first responders to have reliable, unhindered access to a controlled network, allowing them to receive and deliver critical information while ensuring effective emergency response. Unfortunately this is currently not the case. Due to power outages and cell tower damages, the infrastructure for communications is not readily available during the response to an incident or disaster, and furthermore, the cost of this infrastructure is unreasonable, even for large organizations.